If you are about to embark on a content marketing campaign, you need to know exactly what will stimulate online growth and engagement. Text-based content is always going to be an integral part of marketing, but to really set yourself apart in the digital era, visual content must play a pivotal role in all of your efforts. 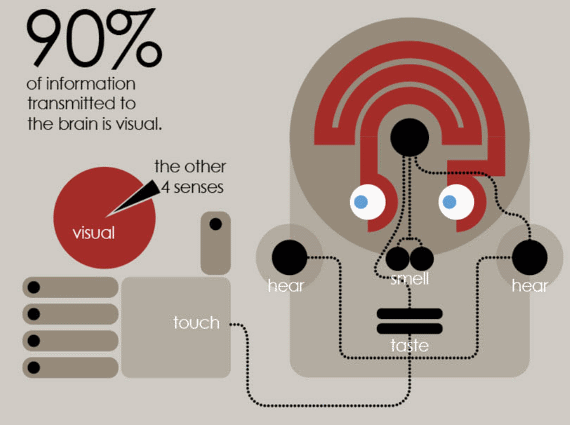 When you consider that 65% of people are visual learners, 90% of information that comes to the brain is visual, and presentations with visual aides are 43% more persuasive, it makes sense to use content types which people have an innate psychological resonance with. Here are 6 types of visual content which will take your marketing campaign to the next level. When you split up a body of text with some compelling images, people are more inclined to finish reading what you’ve written (provided that the images are high quality and contextually relevant). Marketer Jeff Bullas cites that articles with images get 94% more views than those without. Due to the oversaturation of digital content and the increased adoption of mobile internet access, attention spans are shorter than ever, which makes content presented in the form of big blocks of text very off-putting. It’s preferable to use original images or ones taken by you, as this adds a much-desired personal touch to your campaign. High quality, attractive images are often expensive to purchase or time consuming to create. Fortunately, with resources such as Canva, you can create unique, captivating images for free with a simplistic drag-and-drop interface. Alternatively, there are an endless amount of excellent quality photos on photo-sharing sites such as Flickr and Morguefile that can be acquired for free. Due to the vast amount of photos on these sites, it’s unlikely that other businesses within your niche will have used them already. Just be sure you have the authority to use them. Videos are incredibly useful for presenting common problems and then showing the solutions that your product can offer. While there are much cheaper types of visual content available, a great video serves as extra clout for your campaign by demonstrating that you’re prepared to go the extra mile for quality. One study showed that including a video on a landing page increased conversions by 86%. There are numerous types of videos that can enhance your business – you could consider how-to videos, animated explainer videos, demonstrations or customer testimonials. Whatever your choice, it’s important that the videos are congruent with the overall style and ethos of your brand. A recent study by Moz shows that posts with videos receive nearly 300% more inbound links, so make sure that your video is of the highest caliber, as it can become the chief representation of your brand in the digital realm. Infographics are an excellent tool for drawing upon all of your complex data and statistics and collating them into a compelling, easily intelligible visual display. Accompanied by diligent promotional endeavors (including networking with key influencers, landing page optimization and social media), infographics can become an integral part of your content marketing strategy. To reap the true rewards of an infographic, it’s essential that the layout and design is as impactful as possible. The designer must combine the right colors, shapes and fonts to convey your important data. The information you choose to include in the infographic must be accurate (peer-reviewed sources are ideal) and contextually relevant. Sometimes even the most seemingly mundane statistics can be brought to life when conveyed as stunning visualizations. However, ensure all visual elements actually carry the narrative – it’s not worth disrupting your story just to flaunt your virtuosity with Adobe Illustrator! Bloggers tend to love a good infographic, so if you promote yours effectively, it’s highly likely that it will be circulated throughout the blogosphere as well as on social media platforms. More shares means more publicity for your brand, especially if it achieves the highly adorned “viral” status. When you share your infographic via social media, it’s best to include a thumbnail image as well as a hyperlink to your site where the full image is hosted. This enables you to bypass any size restrictions on social media platforms and bring more traffic (and inbound links) to your site. The term ‘meme’ was first coined by Richard Dawkins in 1976 to ascribe an idea the capacity to replicate itself into different meanings from person to person. Memes are now commonly known as images that are accompanied by humorous captions. 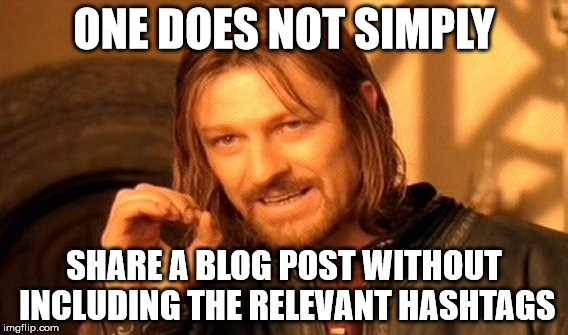 Not many people envisaged that memes would play a role in content marketing when they first started to gain traction online, as they were primarily shared and made popular by college students as a form of entertainment. However, they now represent an easy-to-create, quirky form of visual content. Creating your own meme is a great way to evoke positive emotions and set yourself apart from your competitors. Firstly, you must determine if memes are appropriate for your niche and whether or not they will gain actually engagement with your audience. If your brand resonates with a younger demographic, then you have your answer! Another unique benefit of memes is that they allow you to create in-jokes about your industry, which is a great way to make people laugh and build a community around your brand. Gone are the days where presentations are restricted to just the boardroom; you can now share your presentation with the world via sites like SlideShare, dramatically expanding the outreach of your business. A great SlideShare presentation allows you to inform and communicate to your audience, no matter what device they are using. Presentations serve a similar function to infographics, with a large focus on attractive design and color, thereby drawing the reader into the text. Although, they differ though by having a greater scope. Thus, if a topic is too lengthy to be appropriate for an infographic, a beautifully crafted presentation can be extremely effective at keeping people engaged with your content. Rand Fishkin’s (highly viral) presentation on content marketing mistakes is an excellent example of how to present complex information in humorous, digestible slides. The presentation is not only entertaining, but it also provides the user with actionable advice for how to improve his or her content strategy. As your presentation is likely to include a lot of information, it’s crucial to remain consistent with things like fonts, borders and colours. Just like with any form of content, proofreading for spelling and grammar mistakes is paramount. As with infographics, always keep your sources as reputable as possible (citing wikipedia.org is far from ideal). Instead, look at who Wikipedia sources, and see if they’re reputable. If they are, you can reference them instead of the Wikipedia article. With a screenshot, you can provide your audience with a glimpse into the inner workings of your product or service. You can show what services and functions you offer from a direct perspective, and you can even combine your screenshot with some marketing copy or a testimonial to boost your credibility. Despite seeming like the least awe-inspiring type of visual content in this article, screenshots can be hugely beneficial as a trust-building tool. Consider using them to capture customer reviews or testimonials from industry forums or social media (88% of people read reviews to determine the quality of a business). Additionally, you may wish to incorporate screenshots into your infographics and SlideShare presentations, as they can bring forth more meaning to the stats or information you are presenting. Skitch is a great tool for creating graphics and text on images. It’s simple to use and free. Visual content taps into the visceral psyche of your audience, encouraging them to discover more about your brand. If you can generate high quality visual content which truly resonates with people and promote it on a regular basis, the reputation and awareness of your brand is sure to skyrocket. However, if your content is bland or badly designed, you will end up doing more harm than good – always consider the needs of your audience and don’t put out content just to stick to an upload schedule. As with any type of content, it’s the substance that counts, but excellent style is definitely appreciated. About the Author: Lucien Joyce is the Lead Copywriter at Mammoth Infographics. His background is in creative media and digital marketing. Aside from writing, Lucien enjoys producing music and the occasional globe trot.